Hi Friends! Welcome back to the blog! Today we are sharing a Meyer lemon love potion drink that is perfect for you and your sweetheart to enjoy together on Valentine’s Day! In a large mason jar or bowl, add sugar, hot water, lemon juice, and stir to combine. Add in raspberries and 3 basil leaves. 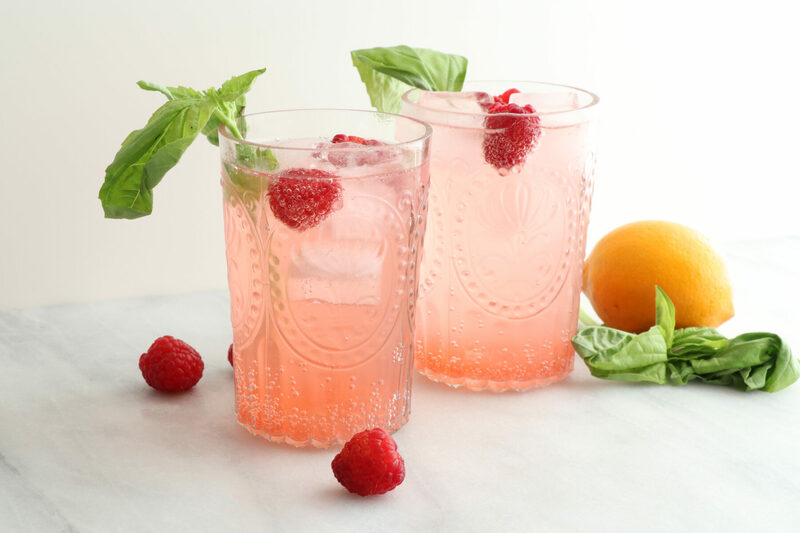 Using a muddler, crush raspberries and basil leaves into drink and stir until well incorporated. Fill two large glasses with soda water or champagne. Using a cocktail strainer, divide the raspberry mixture evenly into both glasses. Top drinks with a couple of raspberries and basil leaves.